The next time you toss a coin into the Trevi Fountain in Rome, you could be unwittingly making a donation to the Roman government. Rome Mayor Virginia Raggi has announced that the coins, which can add up to more than 100 million euros!! per year, will now be used to fund city projects, which will be decided upon by a city hall working group. Since 2006, the money has been donated to Caritas, a Catholic charity that collects the change daily and whose social programs benefit underprivileged people around the world. 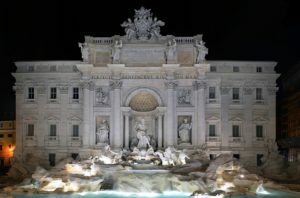 This summer, Raggi implemented fines of up to 240€ for bathing in, sitting on, or eating around the Trevi Fountain and 40 other historic fountains in Rome. In addition, newly erected barriers around the monument and increased security were put into place to ensure tourists are behaving properly. The Trevi Fountain was commissioned by Pope Urban VIII in 1629, designed by architect Nicola Salvi, and completed in 1762. A tradition held since the 19th century, tossing a coin over your right shoulder into the fountain is said to bring luck and ensure your return to Rome. Whether it’s luck or coincidence, the Trevi Fountain draws crowds year-round, including repeat visitors of course, to experience one of Rome’s most iconic monuments.